You can monitor your customer master keys (CMKs) using Amazon CloudWatch, which collects and processes raw data from AWS KMS into readable, near real-time metrics. These data are recorded for a period of two weeks so that you can access historical information and gain a better understanding of the usage of your CMKs and their changes over time. For more information about Amazon CloudWatch, see the Amazon CloudWatch User Guide. When you import key material into a CMK and set it to expire, AWS KMS sends metrics and dimensions to CloudWatch. You can view the AWS KMS metrics using the AWS Management Console and the Amazon CloudWatch API. The AWS/KMS namespace includes the following metrics. This metric tracks the number of seconds remaining until imported key material expires. This metric is valid only for CMKs whose origin is EXTERNAL and whose key material is or was set to expire. The most useful statistic for this metric is Minimum, which tells you the smallest amount of time remaining for all data points in the specified statistic period. The only valid unit for this metric is Seconds. Use this metric to track the amount of time that remains until your imported key material expires. When that amount of time falls below a threshold that you define, you might want to take action such as reimporting the key material with a new expiration date. You can create a CloudWatch alarm to notify you when that happens. For more information, see Creating CloudWatch Alarms to Monitor AWS KMS Metrics. AWS KMS metrics use the AWS/KMS namespace and have only one valid dimension: KeyId. You can use this dimension to view metric data for a specific CMK or set of CMKs. How Do I View AWS KMS Metrics? You can view the AWS KMS metrics using the AWS Management Console and the Amazon CloudWatch API. If necessary, change the region. From the navigation bar, select the region where your AWS resources reside. In the content pane, choose the All metrics tab. Then, below AWS Namespaces, choose KMS. Choose Per-Key Metrics to view the individual metrics and dimensions. To view AWS KMS metrics using the CloudWatch API, send a ListMetrics request with Namespace set to AWS/KMS. The following example shows how to do this with the AWS Command Line Interface (AWS CLI). You can create a CloudWatch alarm that sends an Amazon SNS message when the value of the metric changes and causes the alarm to change state. An alarm watches a single metric over a time period you specify, and performs one or more actions based on the value of the metric relative to a given threshold over a number of time periods. The action is a notification sent to an Amazon SNS topic or Auto Scaling policy. Alarms invoke actions for sustained state changes only. CloudWatch alarms do not invoke actions simply because they are in a particular state; the state must have changed and been maintained for a specified number of periods. When you import key material into a CMK, you can optionally specify a time at which the key material expires. When the key material expires, AWS KMS deletes the key material and the CMK becomes unusable. To use the CMK again, you must reimport key material. You can create a CloudWatch alarm to notify you when the amount of time that remains until your imported key material expires falls below a threshold that you define (for example, 10 days). If you receive a notification from such an alarm, you might want to take action such as reimporting the key material with a new expiration date. In the navigation pane, choose Alarms. Then choose Create Alarm. Choose Browse Metrics and then choose KMS. Select the check box next to the key ID of the CMK to monitor. In the lower pane, use the menus to change the statistic to Minimum and the time period to 1 Minute. Then choose Next. For Name, type a name such as KeyMaterialExpiresSoon. Following Whenever:, for is:, choose <= and then type the number of seconds for your threshold value. For example, to be notified when the time that remains until your imported key material expires is 10 days or less, type 864000. For for consecutive period(s), if necessary, type 1. To use a new Amazon SNS topic, choose New list and then type a new topic name. For Email list:, type at least one email address. You can type more than one email address by separating them with commas. If you chose to send notifications to an email address, open the email message you receive from no-reply@sns.amazonaws.com with subject "AWS Notification - Subscription Confirmation." Confirm your email address by choosing the Confirm subscription link in the email message. When you schedule key deletion for a CMK, AWS KMS enforces a waiting period before deleting the CMK. You can use the waiting period to ensure that you don't need the CMK now or in the future. You can also configure a CloudWatch alarm to warn you if a person or application attempts to use the CMK during the waiting period. If you receive a notification from such an alarm, you might want to cancel deletion of the CMK. 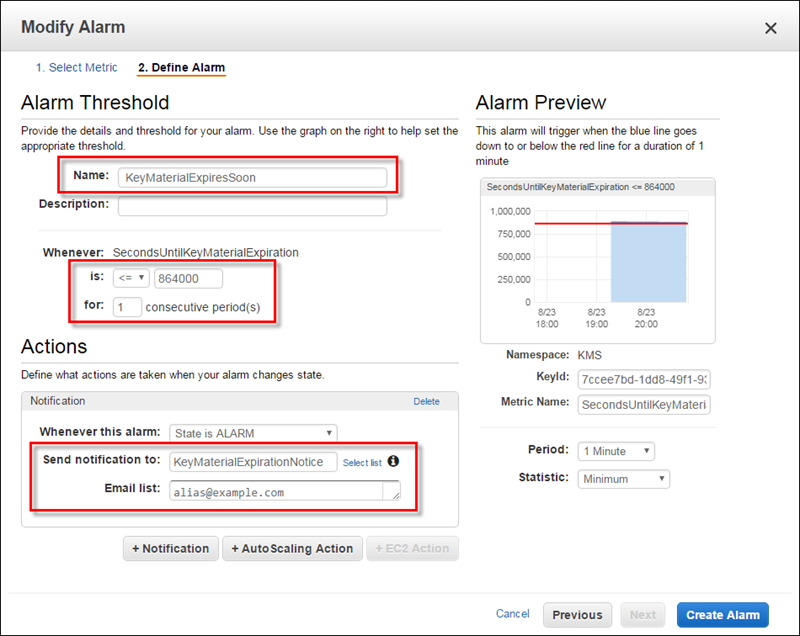 For more information, see Creating an Amazon CloudWatch Alarm to Detect Usage of a Customer Master Key that is Pending Deletion. For more information about using CloudWatch Events with other kinds of events, including those emitted by AWS CloudTrail when it records a read/write API request, see the Amazon CloudWatch Events User Guide. The following topics describe the CloudWatch Events that AWS KMS creates. When you enable annual rotation of a CMK's key material, AWS KMS creates new key material for the CMK each year and sends a corresponding event to CloudWatch Events. The following is an example of this event. When you import key material into a CMK, you can optionally specify a time at which the key material expires. When the key material expires, AWS KMS deletes the key material and sends a corresponding event to CloudWatch Events. The following is an example of this event. When you schedule key deletion for a CMK, AWS KMS enforces a waiting period before deleting the CMK. After the waiting period ends, AWS KMS deletes the CMK and sends a corresponding event to CloudWatch Events. The following is an example of this event.